Not just Nurses, College Instructors too! - Gateway to Canada | Canada Immigration Consultancy! Not just Nurses, College Instructors too! Before you think that only Registered Nurses are being processed faster, here's a case of a College Instructor who received her visa six months after submission of supporting documents to Canadian Visa Office in Manila. People never plan to fail. They just fail to plan. But Ms. Joy Delfin, a College Instructor, is different. Just like Mr. Bantugan, she decided to file an application for Permanent Resident Visa through Federal Skilled Worker program despite being told that the process may take about 3-5 years. She filed her application on August 20, 2008 under the Simplified Application Process. 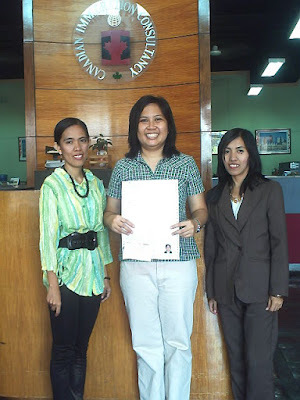 Ms. Joy Delfin received a positive assessment from Centralized Intake Office (CIO) on Jan 17, 2009 and was able to submit the supporting documents on May 12, 2009. She received her visa on Nov 9, 2009.